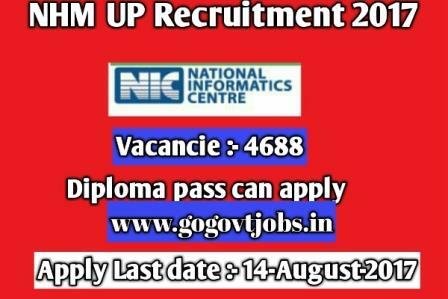 National Health Mission Uttar Pradesh has going to recruit fresh candidates for the recruitment of ANM Staff Nurse. for the recruitment will be on direct basic. Eligible candidates can apply till 14-August-2017. NHM UP released total Number of post :- 4688 qualification for these post candidates have to pass Diploma in nursing/midwife. Diploma in general nursing or B.Sc and Post graduate degree in phychology/social work/ anthropology or equivalent. Qualification :- Diploma In Nursing/Midwife. Application fee :- General candidates have to pay Rs 100/- and OBC/ST/SC candidates have to pay Rs 50/- through debit/credit card or net banking. Eligible candidates can apply online through website below Link till 14-August-2017. candidates can take printout of filled application form for future reference. Incomplete application or application containing false information will be rejected. In-service candidates have to apply through proper channel. Application received through any other mode will be rejected. Canvassing in any form will be considered as disqualification. Age relaxation will be given as per the rules.